Sometimes you really like the music you're listening to, but you really can't put your finger on the style. 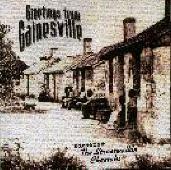 The Streetwalkin' Cheetahs and their "Gainesville" CD are like that. The first cut is a Beatles-esque ditty that was strange, kinda cool, but did not prepare me for the rest of the album, which is totally and completely different. So, after careful consideration and several listens, I guess you'd categorize "Gainesville" as punk rock, but it also has hints of classic rock, heavy metal and a more that I simply don't recognize. All that being said, "Gainesville" is music from the heart, fast, to the point and very well done. Each song showcases a different aspect of this band and that hooked me from the start. When you talk about that mysterious, sometimes unidentifiable thing that makes a band good, great or whatever, Streetwalkin' Cheetahs certainly has it. This band is a unique joy to experience. The Streetwalkin' Cheetahs: Frank Meyer - vocals and guitars; Art Jackson - guitar; Eric Herrmann - drums and vocals; John Ramirez - bass. For more information, check out http://www.thestreetwalkincheetahs.com. Copyright © 2004 by R. Scott Bolton. All rights reserved.